Our fleet of Sea Pearl sailboats are unique and rare. 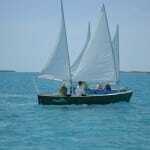 Although they are no longer being made, they are perfect for sailing in The Exumas. The majority of the area we sail in is shallow with sandbars that we can skip over as shallow as 1 foot! For lunch stops and landing at camp we simply sail the boats straight up to the beach and unload them. 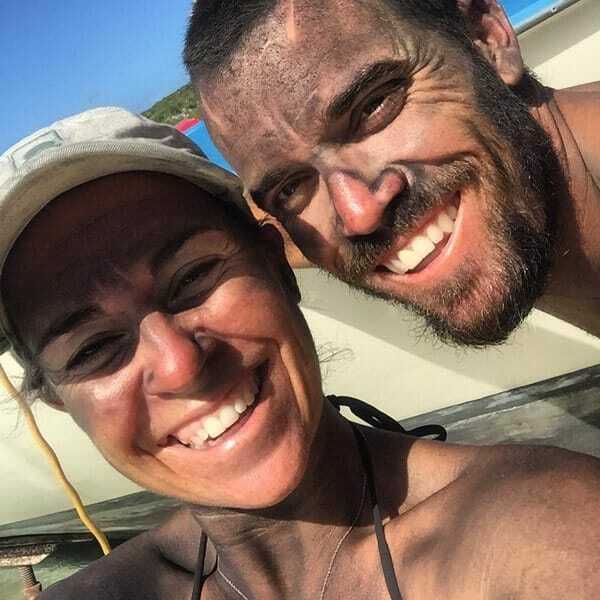 You will be sailing your boat with your partner or up to two other people, and the Out Island Explorers guides will be leading the way in the power support boat. Your boat will be equipped with your own radio to communicate to the other boats and the support boat, a detailed chartbook of the area, and a Yeti Cooler with Ice so you can sip some cold beer as you cruise along. 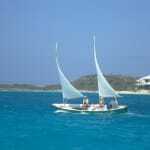 We will island hop through the Exuma Cays for approximately 60 miles, camping on different island along the way. The days will be spent sailing, snorkeling, fishing and relaxing. The nights will be spent with great company around the fire chatting about the day and sleeping under the stars. After ending the trip in Staniel Cay ( a small Bahamian Settlement half way up the Exuma Cays), we will spend the night in an air conditioned room and meet as a group for a final dinner on the island. 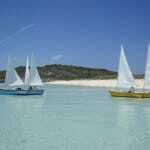 There will then be a charter flight the following morning to return you to Great Exuma where the adventure began. What an adventure! 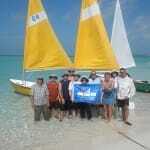 We sailed beautiful well maintained 21′ Sea Pearls. A blast just doing that. In addition, we swam with sea turtles, spotted eagle rays, nurse sharks, stingrays and more! We met the locals on Little Farmer’s Cay, explored Thunderball Grotto, ate lunch on an island of hungry iguanas (don’t tease them, they DO bite, LOL), and visited the swimming pigs! We camped underneath the stars, sipped cocktails around the campfire while Dallas prepared the most delicious meals, and drank ice cold Kaliks to wash down the best dessert. 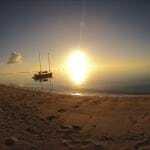 At our final destination of Staniel Cay, we enjoyed hot showers, warm beds, outstanding restaurant dinner and first class breakfast at the Staniel Yacht Club before boarding the airplane flight back to the starting point of our adventure. We can’t wait to go back and do it all again!